Just how big is Smallville? 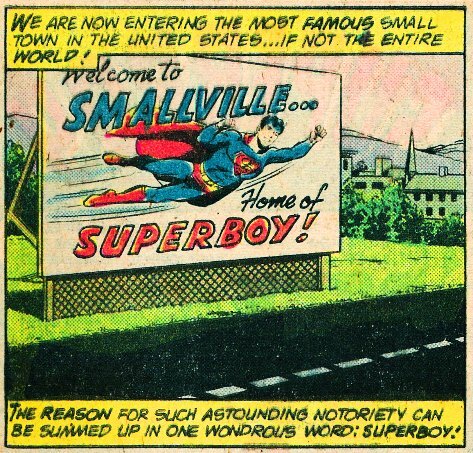 Since its naming in “Superboy” #2 in 1949, Superman’s childhood hometown has officially been the town of Smallville. While its aspects (and location) have varied over the decades since, one thing’s consistent: that it’s, well, a small town. Or is it? Just how small, or big, is Smallville’s population? From “New Adventures of Superboy.” Art by Kurt Schaffenberger. Across various versions, Smallville’s a town with multiple local businesses, with farms surrounding the town. They all seem to at least agree that it only has one public high school, Smallville High School, alma mater of Clark Kent, Pete Ross, and Lana Lang. I should note that the earliest comics of the Golden Age either don’t mention where Clark grew up or even claim it’s Metropolis. Still, Smallville became retroactively the Golden Age Superman’s hometown, too, per 70s and 80s Earth-2 stories. However, since Superboy didn’t exist on Earth-2, its Smallville stayed a very small town. Like other versions, Smallville never has never really had an “official” population figure. However, a sign outside of town in “Superboy” #153 (January 1969) states its population is 15,284 people. Interestingly, the story focused on the entirety of the town’s population vanishing without a trace. A map of Smallville published in 1981’s “New Adventures of Superboy” #22 shows that the town’s features include: several churches; a synagogue; the then-former Kent family farm outside of town; the Smallville Orphanage (from which Clark was adopted); a single elementary school (in addition to the high school), presumably K-8; a tourism bureau; a stadium (presumably used by the high school, as well as for concerts, etc. ); a museum; the Kent General Store; and a single daily newspaper, the Smallville Sentinel. Smallville also has a radio and television station in one building (presumably the same owner). I’d assume the TV station is a low-power or small independent one, given most stories show the denizens get most of their TV/radio from some nearby larger city. Another landmark Smallville had in pre-Crisis stories was (outside of town) a billboard with Superboy on it, welcoming visitors. From “Action Comics” #815 (July 2004). Art by Ivan Reis. Following Byrne’s 1986 reboot of the Superman mythos, DC published a “World of Smallville” miniseries in the late 80s. 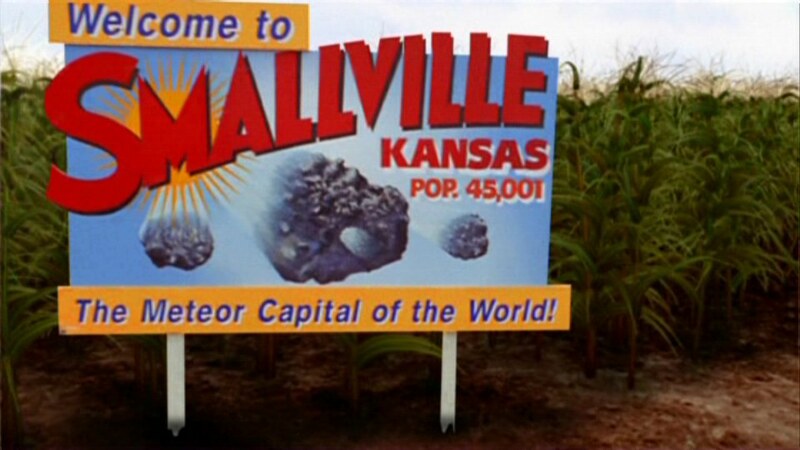 Stories post-Crisis firmly stated Smallville’s location as being in Kansas. However, the population sizes seem at odds with the idea of Smallville being a “small town,” or population sizes appropriate for Kansas. One figure I’ve seen given is from 1990’s “Atlas of the DC Universe,” a role playing game supplemental guide. There, Smallville’s population totals 90,000 people. Another figure is from 2004’s “Action Comics” #815, where Smallville’s population is a whopping 110,000 people, the largest I’ve seen cited anywhere. 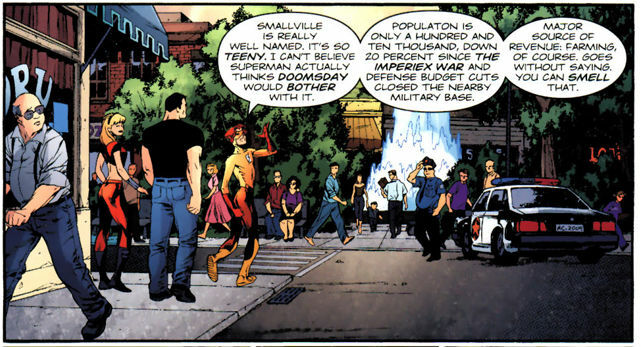 Kid Flash notes that Smallville also had a then-recently-closed military base, and that the population is “down 20%” since the base’s closure/the “Imperix War” storyline. Yet Kid Flash calls this Smallville “teeny”?! The New 52 also has gotten in on the Smallville population size game. In “Superman Unchained” #2 (Sept. 2013), we learn that New 52-Earth’s Smallville has a population of roughly 36,000 people. That’s smaller than the post-Crisis examples previously given, at least, but still fairly large for a Kansas town. Finally, the “Smallville” TV series stated the town’s population grew from 25,001 people in 1989 (when Clark landed on Earth) to 45,001 by the then-present. Part of the population boom is due to industry growth (Lex Luthor’s father’s company) and the meteor shower that happened during Clark’s landing on Earth. The wiki for the TV show lists a few of the features of this version of Smallville. Like its pre-Crisis counterpart above, Smallville has a radio and television station. It also has taverns, a bowling alley, a newspaper (here called the “Smallville Ledger”), a dam/reservoir, and the Kent farm. This version of Smallville, like its Silver Age version, is located within driving distance of the New York/Chicago sized Metropolis, but both locations are (improbably) in Kansas. Metropolis usually is the size of Chicago or New York, and thus dwarfs the largest metropolitan area in the region, Kansas City, by a good margin. For the record, here’s the populations of Kansas’ 10 largest cities, with the above versions of Smallville inserted accordingly. Figures are from 2013 estimates by the US Census Bureau. At #11 (behind Salina) is Hutchinson, with an estimated population of 41,889. I mention it because a few Superman fans there lobbied the city government to hold a “Smallville Day.” The fans cited Hutchinson’s similarities to Smallville (largely the TV show’s version). So according to the above, far from being a “small town,” Smallville was claimed to be as big as the sixth biggest city in Kansas. Even the TV show’s version would clock in at 11th place, several thousand away from being in Kansas’ top 10 biggest cities. Factoring in that Overland Park, Olathe, and Kansas City, KS are all part of the Kansas City metropolitan area, that’d also make Smallville as big as the fourth largest metropolitan area in the state. I suppose an inflated population size would explain some of Smallville’s amenities, and why it attracts all manner of threats (aliens, supervillains, bank robbers, conspiracies, etc.) even in versions without a Superboy. There’s also urban/suburban sprawl in more modern times as a possible factor. However, it sometimes feels like writers didn’t really think about what’s considered “small” by Kansas standards, versus New York or Los Angeles. Then again, considering those two sources (and how Hollywood/New York depict or view “flyover country”), maybe I shouldn’t be surprised at what they consider to be a “small” town. I’ll note that yours truly grew up in a small midwestern town…one which, based on the above mentioned population figures, is apparently smaller than most versions of Smallville. Then again, while my hometown does have farms outside of town, my “Smallville” never had a Boy of Steel (or bald teenage criminal masterminds, meteor showers, etc.) around to liven things up. Previous Post:Twitter to offer an algorithm-based timeline? Interesting article! Thanks for posting!